Known as “The Eight Wonder of the World”, the Astrodome has hosted many sporting events for more than 40 years. Its history stretches back to the mid 1950s, when a domed stadium was planned by Judge Roy Hofheinz. Trying to attract major league team for the Houston area, Hofheinz built a model of a domed stadium. The primary purpose of building a stadium was to attract a professional baseball team. By October 1960, Houston was awarded a MLB franchise. Voters then approved a $18 million bond to build a stadium and construction began January 3, 1962. The stadium would be able to host numerous events from baseball to football to boxing matches. Founded in 1960, the Houston Oilers originally played at Jeppessen Stadium for five seasons. The team then spent three seasons at Rice Stadium. Originally known as the Harris County Domed Stadium, the stadium opened in 1965. The Houston Astros (MLB) played the first game ever at the Astrodome on April 12, 1965. Six levels of multicolored seats circled three-fourths of the stadium. 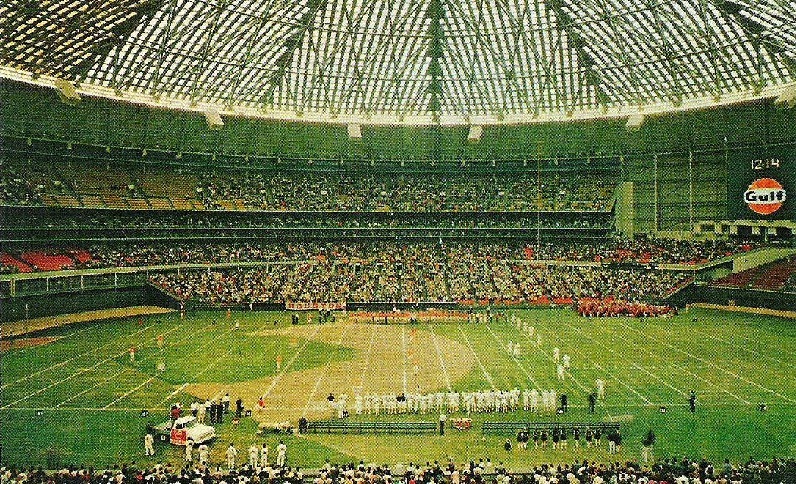 The Astrodome became home of the University of Houston’s football team in 1965. It was one of the first stadiums to have luxury suites with 53. Each of the 42,217 seats in the Astrodome were cushioned. Behind the end zone was a $2 million 474 foot long scoreboard and display picture board. The actual dome is 18 stories above the playing field, and consists of “Lucite” skylights that originally allowed sunlight to help grow the natural grass playing field. However, these translucent panels presented a problem. During afternoon baseball games, outfielders were blinded by the sunlight. Thirty percent of the panels were coated with paint to reduce the problem. This led to the natural grass dieing because enough sunlight was not reaching it. A new type of turf named after the team, Astroturf was introduced after the 1965 season. The Houston Oilers made their debut at the Astrodome on September 9, 1968. In order for football to be played at the Astrodome, two sets of 5,000 seats could be moved to form a football gridiron. The Astrodome retained the same look until 1989. <align=”left”>In 1987 Oilers owner, Bud Adams, threatened to move the team to Jacksonville but Houston officials renovated the Astrodome adding 10,000 seats and additional luxury suites. This expansion increased the seating capacity to over 60,000 for football. Five tiers of seating now enclosed the playing field. The original scoreboard was replaced by new video boards in the upper deck. By the mid 1990s, both tenants of the Astrodome, the Oilers and Astros wanted new individual stadiums. Adams was not satisfied as he began to lobby for a new dome stadium to be built in downtown Houston. In 1993 Adams was willing to contribute $85 million to a stadium but Houston officials and residents were not willing to fund a new stadium. After failing to receive support for a stadium the Oilers relocated to Nashville. The Oilers played their last game at the Astrodome on December 21, 1996. The Astros played two more seasons at the Astrodome before moving into Minute Maid Park in downtown Houston. Today, the Astrodome continues to serve as home to many events. In 2000, Houston was awarded an expansion NFL franchise, the Houston Texans. They began playing at Reliant (NRG) Stadium in August 2002.